Many Rolex buyers choose to purchase a Submariner, Daytona, or GMT-Master; however no watch is as true to the original Rolex company spirit as their Explorer line of watches. Rolex has always had a reputation for producing high-end products; however the company was not always regarded as the ultra-luxury brand that it is today. Instead, Rolex first cut its teeth producing high-end timepieces that could withstand exposure to conditions that would simply destroy other watches, such as water, dust, and dirt. Rolex Explorer ref. 214270 is a simple watch, yet highly desireable. 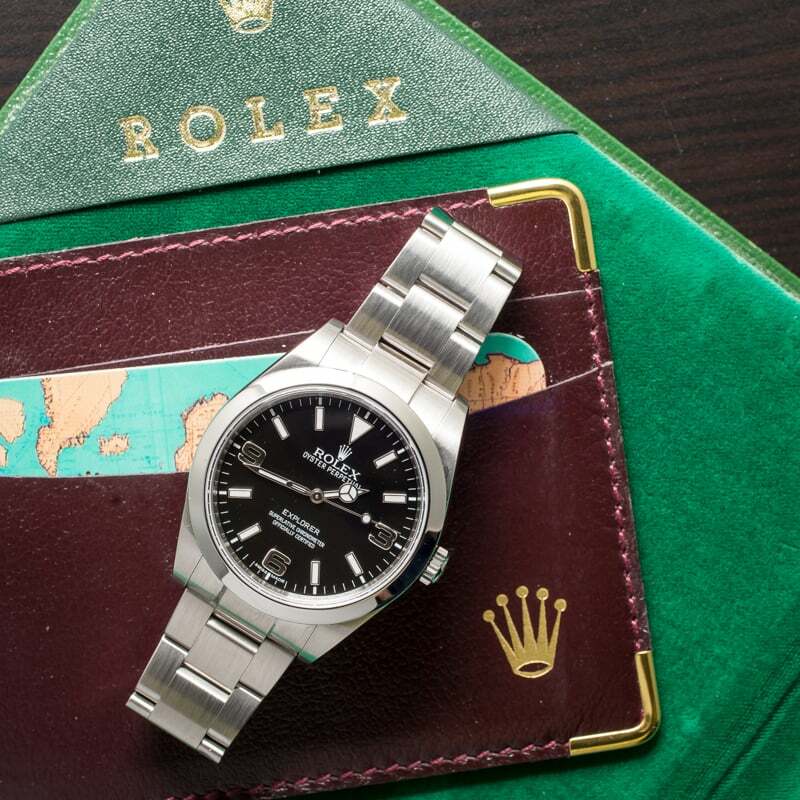 Originally introduced in 1953, the Rolex Explorer received its now legendary name when Sir Edmund Hillary became the first person to summit Mount Everest. In celebration of his tremendous feat, Rolex released the Explorer: a watch made specifically for the adventurer or those with active lifestyles. The original Rolex Explorer was just a straightforward and well-built sports watch. The self-winding movement was housed in a thick stainless steel case with a fixed bezel and screw-down crown and case back. To help make it more resilient to harsh climates, temperature-resistant lubricant was used on the movement, which allowed it to operate accurately under temperatures ranging from -4° to +104° Fahrenheit. To protect the dial and hands, an extra thick, acrylic crystal was fitted over the Explorer’s easy-to-read, luminous face. 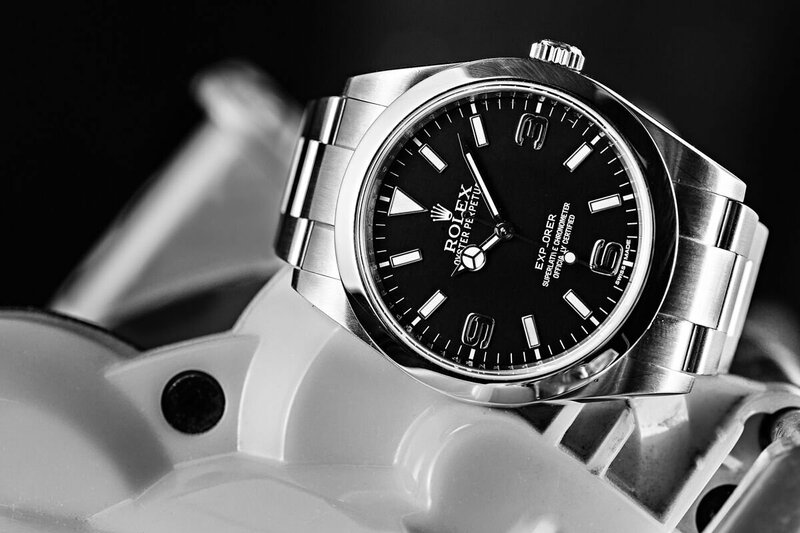 The Rolex Explorer was first dedicated to Sir Edmund Hillary as a necessary timepiece. Over the course of the history of its production, the Explorer line has stayed remarkably true to its roots. However, it has seen subtle updates and additions throughout the years that have helped make it better suited for active lifestyle and the outdoors. 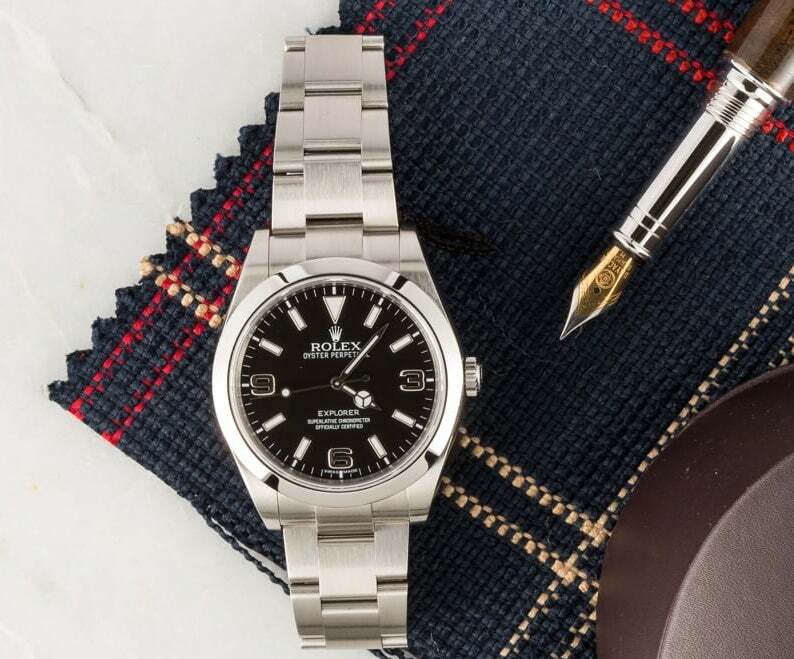 The most recent incarnation of the Rolex Explorer, the reference 214270, still offers users 100 meters of water resistance; however, it has seen its case size increase to 39mm in diameter. Additionally, the caliber 3132 movement inside has been fitted with Paraflex shock absorbers to provide a greater level of resistance to harmful bumps and impacts. From a design standpoint, the Rolex Explorer adheres to a minimalist philosophy, with no extraneous features existing anywhere on the watch. There are no dial color or bracelet options, no day or date complications, and 904L stainless steel is the only material from which the Explorer is made – no 18k gold or two-tone (Rolesor) options exist. The Explorer is built with stainless steel, not with 18k gold. The reference 214270 Explorer is essentially the contemporary equivalent of the very first Explorer watch that Rolex released well over over half a century ago. Although the design has been refined and updated over the years, as better technologies and materials have become available; at its heart, the present-day Rolex Explorer is still very much the same watch that it was when it was first released all those years ago. While it does not get as much attention as Rolex’s Submariner, GMT-Master or Daytona lines of watches, the original Explorer is a timepiece that truly embodies the heart and soul of the Rolex brand. With its robust build quality, minimalist feature set, and a classic design that will never go out of style, the reference 214270 Explorer is a watch that will still look great 50 years from now, and will likely still be running by that point too.